Winters can be cold in our part of the world, and because of that, most enlightened pet owners allow their furry friends to come inside. After all, pets live longer and stay in better health when they share the comforts of a temperature-controlled environment with their human caretakers. Read on and learn about how indoor heating can be used to optimize your pet’s living situation. There’s no ideal, one-setting-fits-all-temperature for pets. Pets come with a wide variety of coats: some are thick, some are thin. Animals with thicker coats usually need less heat than those with thin ones. It’s a good rule of thumb to keep the thermostat between 65 and 75 degrees, adjusting for the season. There is research to suggest that cats in general require warmer temperatures than most dogs. And, some breeds are more sensitive to cold than others; for instance Siamese cats need warmth more than, say, Persians. Give your cat, or your tiny dog with a thin coat, extra blankets and warm bedding if needed. You may even need to supplement with a space heater. Sickly pets or those with joint problems may benefit from warmer conditions. The more body fat your dog or cat is carrying, the less heating it’s likely to need. Make sure overweight pets or animals with thick coats have a cool spot to retreat to. They may even need a fan when the heat is on. When you’re going to be away, don’t turn the HVAC system off in the misguided belief that a pet is somehow akin to its wild relatives and can fend for itself temperature-wise. Some cats and dogs do manage to survive outdoors by burrowing or digging holes, but they can’t do that indoors. Also, if you’re using automatic feeders, do have someone stop by each day to make sure the HVAC is working right and that the animals are not in any distress. 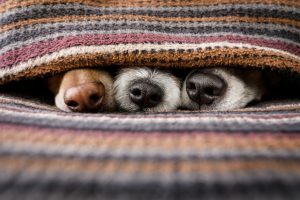 For more on indoor heating for pets and humans, contact Mowery Heating, Cooling and Plumbing of Indianapolis.